Lose weight and still enjoy your favourite foods and drinks! This new flexible program can help you lose weight without compromising on the foods and drinks you love. The Flexi Program allows a selection of Free Foods that you can eat at any time, as well as one Flexi day each week to relax and enjoy the things you love. 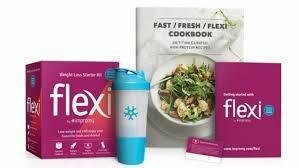 Flexi takes a fast approach to weight loss without compromising on good nutrition. The program has been developed in collaboration with CSIRO and clinically tested to be a safe and effective way to lose weight.